doesn't make a sound when his body is stabbed with a hot iron. Can dig into his own skin and not feel anything. Takes multiple whips from the tail of the Snake Baron in his monster form. but despite it, he continues to fight through a large swarm of undead skeletons. expels them all from his body. form. Note that he still continues to grip his sword during the entire beating. Survives getting kicked by The Count in his Monster form. 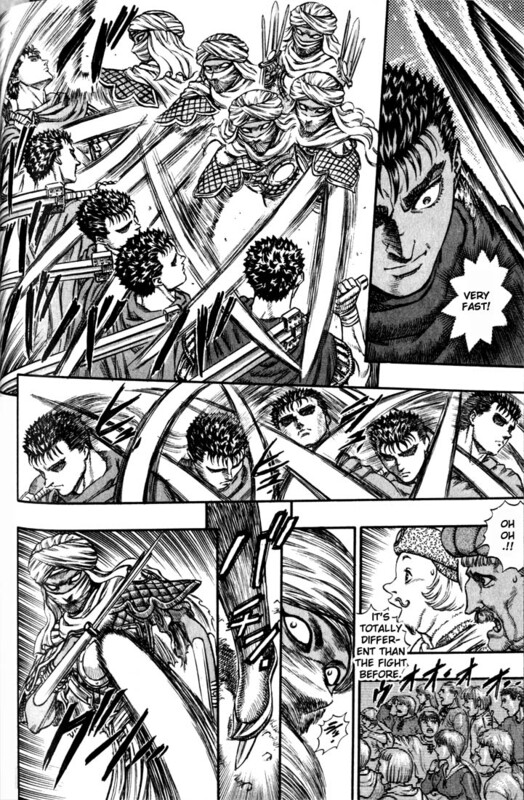 the demon or force is too powerful, Guts can run the risk of being overwhelmed. himself conscious to attack (in vain) Femto/Griffith. and plummeting down a cliff. losing much blood, still has the strength to fight off a pack of wolves. soldiers from the ground up, even afterwards. How deep the tunnel is. 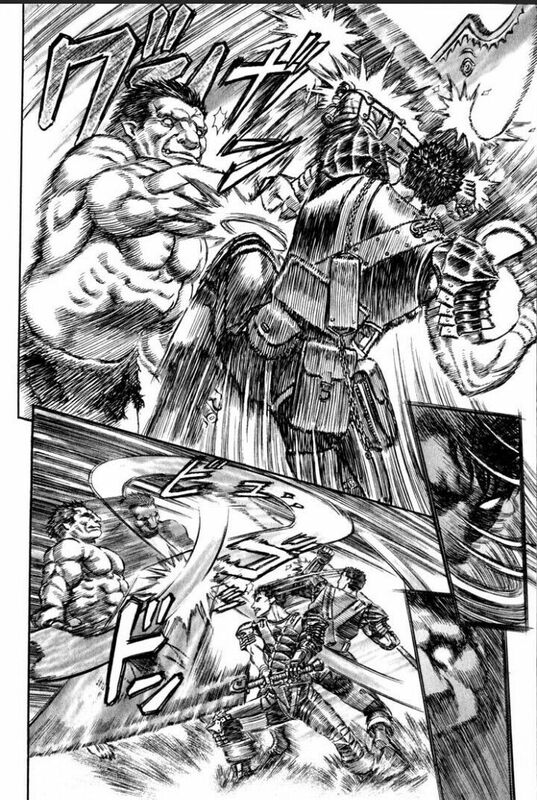 "There isn't a deeper mountain in all of Midland"
Guts after running it, followed by the idiot assuming Guts was too weak to fight anymore. Can shoot an arrow right through a man's nose. Blocks a wave of arrows fired at him at close range. Easily solos a group composed of 50 soldiers + 1 giant heavily armored man. be noted that the commander was far better geared than Guts was. second only to Griffith in terms of swordsmanship. Wading through an entire infantry of heavily armored horseback riders. in a single strike stand-off. easily dispatch of two armored guards. his weapon with great speed. doing all this while still being wounded. Decapitates a man on horseback on the ground with one precise strike. Defeats Griffith in a duel with one strike. to them) from up above. Dodges and evades a giant battle axe being swung by a giant armored knight. states that Guts can actually keep up with the movement. tendril arm, even at the most awkward of angles. Ducks from multiple spears charging at him. overwhelms and decimates this guy by himself. Although on the defensive, is able to keep up with the significantly stronger Nosferatu Zodd. Quickly dispatches of 2 armored guards before they can react. cannot get a bead on Guts. so fast that they aren't even able to get a shot off. Also fast enough to block an attack from above by one of the Baakiraka. Fast enough to catch a tiny escaping Baakiraka.